Palestrina stitch makes a knotted line. It is quick and simple to work once you have the knack, and worth mastering. It gives texture to an outline, and it is easy to work curves. It is very economical, as almost all the thread is on the right side of the fabric. For best results, work palestrina stitch with a sturdy single thread such as pearl cotton, rather than with stranded floss, so that the knots show up well. It is easier to work in the hand rather than in a frame. Step 1: take a small stitch downwards, a little way ahead of the previous stitch. Step 3: slip the needle under the same thread again, to the right of the previous loop and over the working thread. (The needle does not go through the material.) 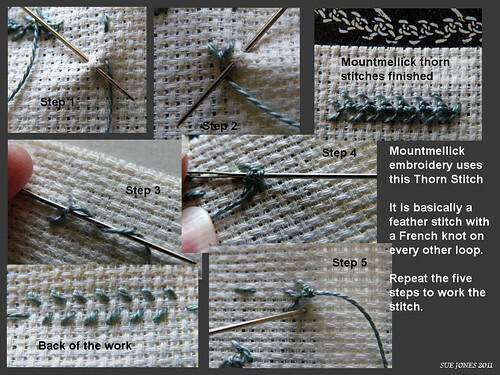 Pull the thread taut to make the knot, and repeat step 1 to make the next stitch. This is the back: just a neat row of small vertical stitches. A new stitch to me, thanks to the Antique Pattern Library Yahoo Group for getting me started on this. Click on the picture to go to a larger version on Flickr. 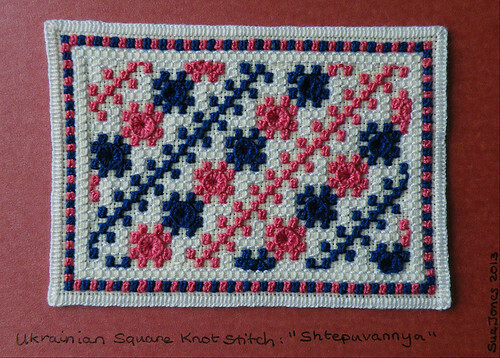 Thanks to Angelica Mountains on Stitching Fingers for introducing me to ‘Shtepuvannya’ – or ‘Ukrainian Square Knot Stitch’ as I find it easier to call it. 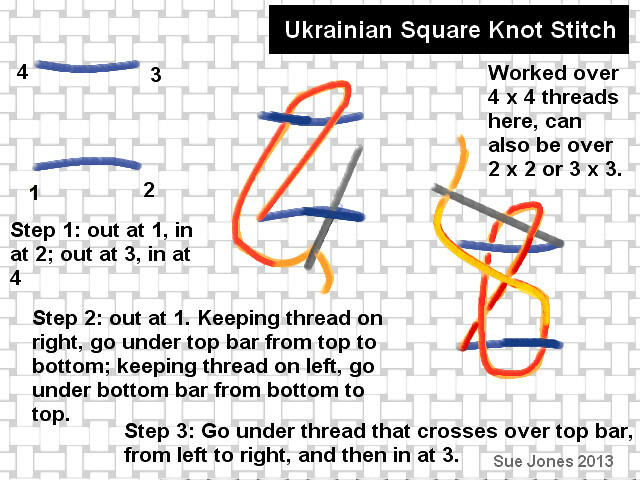 I deduced the stitch construction after seeing a diagram that didn’t quite work from a Ukrainian textbook on traditional embroidery. Although I’ve used several colours for clarity, the stitch is all made with one thread. (Hmmm, you might get an interesting result from using a different colour for Step 1, now I think about it….) Use a fairly thick thread in relation to the size of the stitch for a chunky knot. 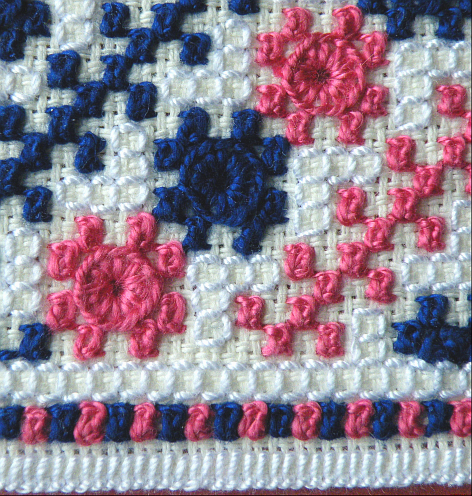 The sample above is on 22-count cotton hardanger worked with #8 pearl cotton over 2 x 2 threads. The circles in the middle of the ‘flowers’ of 8 USK stitches are just buttonhole eyelets worked over 6 x 6 threads. If a pattern requires the bottom left corner of a stitch to use the same hole as the top right of the previous stitch, then make the first movement ‘out at 2 in at 1’ and carry on as before. I like the look of this stitch, it is unlike any other little knotted stitch that I know, and is simple enough to be useful. I hope it will become better known. Try it. What do you think. Great tutorial! I’ll have to edit my post to link this one on my blog too. Thanks! I’ll be adding the link to my blog too, so I remember to visit back! It’s an addictive stitch, have fun with it!